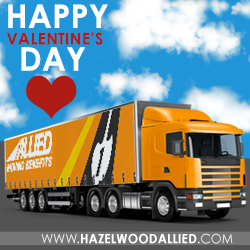 Happy Valentine's Day from Hazelwood Allied Moving & Storage! Valentine’s Day is that special time of year when you can show your loved one appreciation. The McCann family enjoys celebrating this special time of year by making the people in our lives feel special. We know the importance of our relationships regardless if these are short-term or long-term. Giving gifts that warm the heart, such as roses, card and candy are sure to be on your to-do list this year. However, if you need to relocate on this special day, Hazelwood Allied Moving & Storage is here for you! This year Valentine’s Day is on Sunday and if you’ve got a move lined up don’t fret. Simply make this a romantic event and a fun move at the same time. It’s possible with a little creativity and a bit of effort. You will want to take the load off of your loved one’s shoulders and let your Santa Barbara movers do the lifting and loading for you. What better gift could you possibly give that special person in your life if you need to relocate? Surprise your Valentine by getting a quote from our moving company in Santa Barbara. We can do provide you with a free estimate of what it will cost you to relocate. This is sure to ease the mind of your Valentine when moving is on the agenda. 1. Be on time – Remember your first date? The one thing you had to be was punctual to make the best possible impression. At Hazelwood Allied Moving and Storage, we will arrive at your home on time when you schedule your move. We know your time is important, and we respect that. 2. Professional planning – What makes a relationship last? Planning and sticking to the program is how to make your partner happy. Our Santa Barbara movers will evaluate your moving needs and create an individual plan to make your move more blissful and less stressful. Who desires stress on Valentine’s Day? Not you, right? 3. Damage prevention – We’ve been moving people since 1918, and we know your items are valuable to you. We have the expertise to move even the most fragile of your belongings with care. Additionally, we offer mover’s insurance at an affordable price to ease your mind. 4. Prevent physical injury – Valentine’s Day is the time for lovers, not injuries! You need to save your energy to romance your loved one not tending to an ailment. At Hazelwood Allied Moving & Storage we do all the heavy lifting, and this can reduce the possibility of a back injury! Keep the romance in your life on Valentine’s Day and rely on us to help! 1. Train Rides – Consider taking a romantic train ride at Filmore & Western. You’ll feel like you’re back in the 1920’s when you do. This is the heart of the Heritage Village. Don’t neglect to make dinner reservations with the love of your life! 2. Horseback Riding – Take a tour of Santa Barbara with that special person in your life on horseback. You can see all the beauty this city has to offer while having the time of your love. This is sure to make your Valentines’ eyes light up when you’ve got this booked for on the most romantic day of the year! 3. Valentine n' Wine – What screams romance more than a bottle of wine? Not much when you are in the perfect environment. Schedule a wine tasting cruise aboard a 41 ft. Yacht and watch the sunset while you’re enjoying your wine of choice. 4. Romance the stars – Enjoy a display of the universe with the star of your life. You can view the planets and with your cupid by your side when making this your Valentine’s event! 5. Sammy’s wine tours are the perfect choice for a great wine tasting trip this Valentine's Day. Santa Barbara and Santa Ynez are home to some of the best wineries in California. 6. Blush Valentine's Dinner Downtown: This year why not try something different and have a Blush Valentine's Dinner? Blush is a cozy restaurant and lounge that will be open on Christmas from noon until 10:00 p.m. You and your guests can sit back and relax while their chefs do all the cooking.